Are you short on fitness equipment? Well, the Cali Hustle Workout is another one of my free fat burning bonus workouts you can do with very little exercise equipment. All you need for this fat burning workout is one dumbbell and a bench. A pad or something you can place your knee on would also be helpful but not absolutely necessary. Like most of my workouts, anyone at any fitness level can do this routine. You can lower or raise the difficulty of the workout by the size of the dumbbell. Also, just like in my Fat X Program, you want to track your statistics so that you can challenge yourself and best your numbers next time you go through this routine. Below the video demo I’ll go into some specifics. Here’s the free fat burning workout video demo. The Cali Hustle Workout is a full body workout featuring a pull, push and lower body component. Your abs will also get a good workout as well as they need to be engaged with the uni-lateral set up of the exercises in this routine. You’ll really know what I mean when you get to the uni-lateral dumbbell bench press. You’ll need to engage your core (abdominal muscles) to maintain balance and not fall off the bench. The first exercise in the Cali Hustle Workout is an Olympic weightlifting hybrid. You’ll be doing a wide stance uni-lateral High Pull. It’s important to set up in a good hinge position, just like in a good Deadlift or Kettlebell Swing. Then you want to explode the weight up. This is a great exercise to develop power. For fat loss (fat burning) purposes, the power production and tax on your metabolic processes will help raise your BMR (basal metabolic rate). The second exercise is a Dumbbell Bench Press with a twist. The twist is that you’ll be completing all reps on one side, or uni-laterally. This will require your body to call upon auxiliary muscles to help balance the weight. 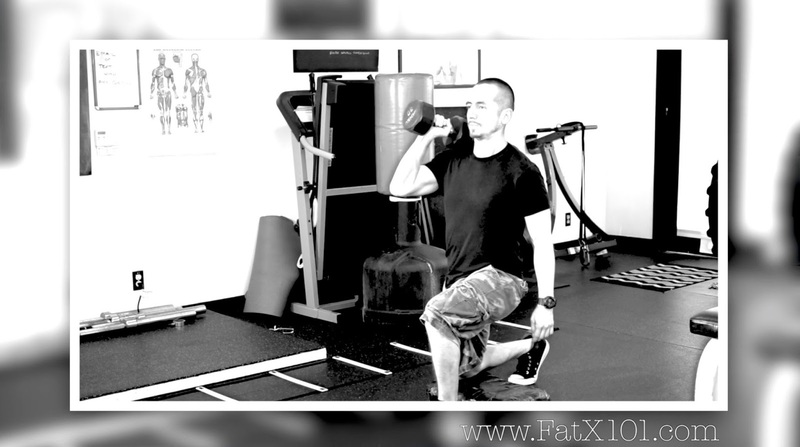 If you’re new to this exercise, you'll expend a lot of extra energy to complete the movement. The last exercise in the Cali Hustle Workout is a lunge. In this variation of the Lunge exercise, your stance will stay stationary and you’ll just be dropping your back knee. I like to put a pad down so that my knee goes the same distance every time. The floor can be rough on the knees. A pad will buffer the impact so you can concentrate on the muscles working rather than the pain of having your knee bang the floor. If you have any questions, as always, feel free to contact me.